Suttons are committed to providing total quality and service excellence. We constantly strive to not only meet but exceed our customer expectations – but don't just take our word for it below are just a few of our recent awards. We're so proud to have been awarded Plant of the Year at the RHS Chelsea Flower Show in 2017. 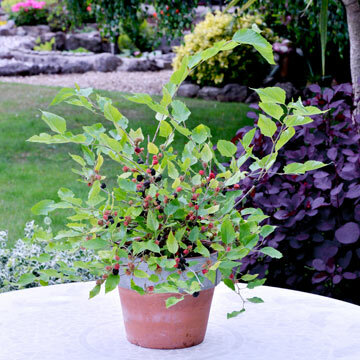 Our beautiful Dwarf Mulberry Bush - Charlotte Russe - means you can now grow your own Mulberries from a potted bush. Wonderfully compact, the Dwarf Mulberry will only reach a height of up to 1.5m, so it's suitable for any garden. Suttons are very proud to have provided the vegetable varieties for The South West In Bloom Garden at Chelsea this year. The display won Gold and was also chosen as best Gold winner in the Grand Pavilion, therefore winning the Diamond Jubilee Award. The garden was opened by Ian Gillan from Deep Purple on press day yesterday and the reaction from press and public alike has been outstanding!! The gardens main sponsors have been Viridor, The Sun, National Collection if Dahlias, Beautiful Fife, South West in Bloom and Suttons Seeds. Gold Medal at Chelsea For 'The Secret Garden of Past & Present'. Suttons Seeds are over the moon to have won a Gold Medal at the Chelsea Flower Show for 'The Secret Garden of Past & Present'. The garden was designed but Lynn and Mark Riches of Horticolous and was also in partnership with Paignton Zoo, Solardome Industries and Hydrogarden. Suttons provided the plants and seeds for the garden, including the fabulous new and exclusive 'Cha Cha Chive'. Paignton Zoo grew many of the plants, including some of the varieties from the James Wong's 'Homegrown Revolution' range, hydroponically with the help of the super new systems from Hydrogarden, to display in the fabulous Solardome. We are proud to have celebrated the 100th birthday of The Chelsea Flower Show and to have won this award in this most prestigious of events. Annual GIMA Awards dinner celebrates the great and good of the garden industry. Suttons provided most of the plants for the Edible Garden and was awarded the Silver-Gilt Kightian medal, its story boards explain how the commercial practice of growing fruit and vegetable by grafting pest and disease-resitant root systems to the best-flavoured plants is now available to amateur gardeners. Suttons 'Magno' Grafted Sweet Pepper Plant was awarded a Which? Gardening Best Buy for having the highest ripe yield. Pitted against 18 other varieties, it was highly praised for its heavy crops and the superb quality of fruits produced. The top ten seed brands were tested by Which? Gardening members and the top ten most popular vegetables and flower varieties assessed. Scores were based on how well seeds germinated, the quality of the packet instructions and survey respondents' ratings for variety, choice, descriptions and value for money, taken into account. Suttons Seeds was awarded Best Buy Seed brand! Consumer magazine Which? Gardening tested Suttons Seeds 'SpeedyVeg' to ensure these seeds live up to their name; and they did! Which? Gardening stated that Suttons Seeds SpeedyVeg is 'Spot on'. Suttons Tomato 'Orkado F1' came out top as the best outdoor growing tomato! The variety was subject to rigorous tests that determined its strength of flavour, texture and appearance, as well as the all important juiciness, skin thickness, colour and shape. 17 seed suppliers were tested, with Suttons Seeds coming out top for our impressively high seed germination and quality of instructions on packets. Suttons Seeds catalogue and website were also praised in the tests for their wealth of helpful advice and photographs. Suttons is the only UK seed company to have achieved the ISO9001:2000 International Quality Standard award across ALL its business operations! Total commitment to both quality and service excellence has been the key to Suttons Seeds remarkable history. We are privileged to have held the prestigious Royal Warrant since 1858 and still supply seeds to several Royal households today. Since 1922 Suttons Seeds have been the official supplier of lawn seed to Wimbledon Lawn Tennis Club and its world famous championship tennis courts. Suttons has held the Investors In People award since 1996, the national standard for staff training, communication and involvement. Suttons strives to run the business ever-more efficiently to meet our customer needs, and investment in staff, equipment and processes enables us to be better placed to do that.